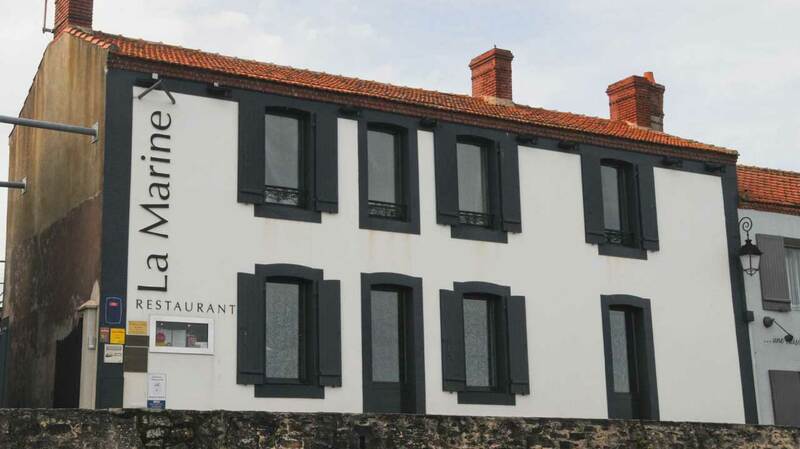 Restaurant La Marine, a landmark food destination located off the west coast of France, in a sea port village on the island of Noirmoutier. 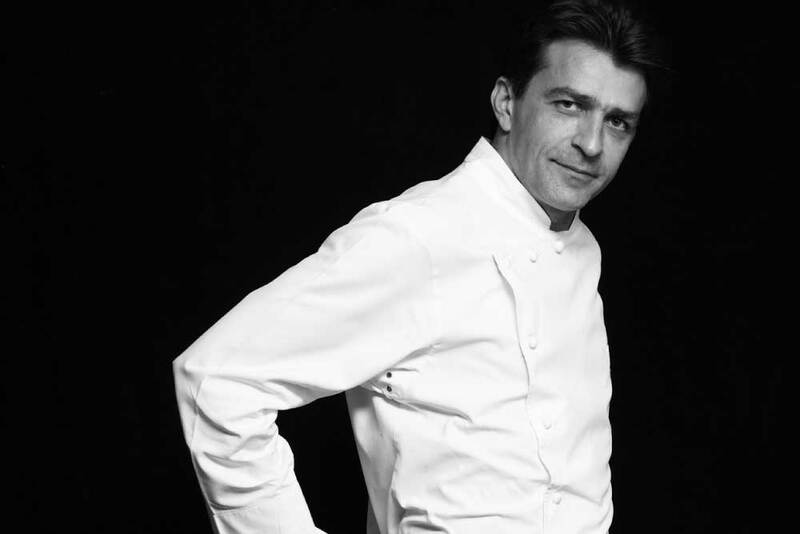 France’s Gault & Millau Chef of the Year 2017 Chef Alexandre Couillon and his wife Celine, born and bred islanders, have taken the humble beginnings of his fathers mussels and chips holiday bistro and created a vibrant modern two Michelin Star restaurant. Passionate foodies from across the globe make the journey to experience the freshest seafood sourced from waters only metres away and prepared to a level of perfection that has seen Chef Alexander Couillon recognised with 5 Toques, No.12 Opinionated About Dining Top 100 European Restaurants 2017, an exceptional 19/20 score from the Gault and Millau gastronomic guide and 2 Michelin Stars. 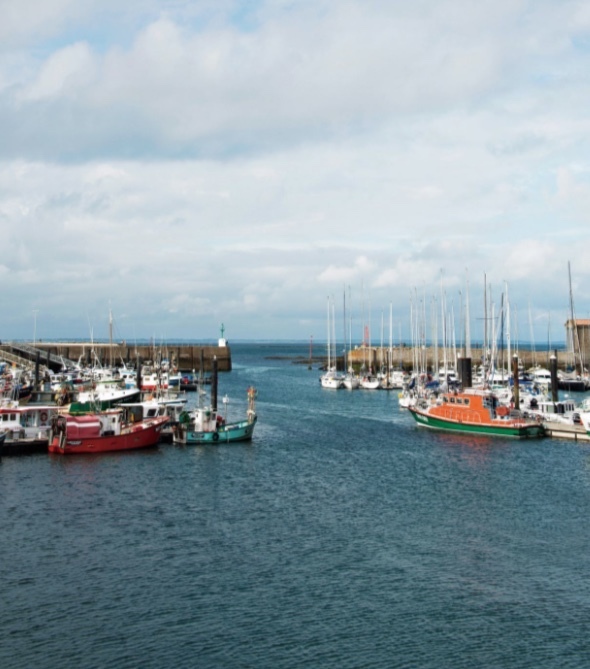 The island of Normoutier – The place they call home. 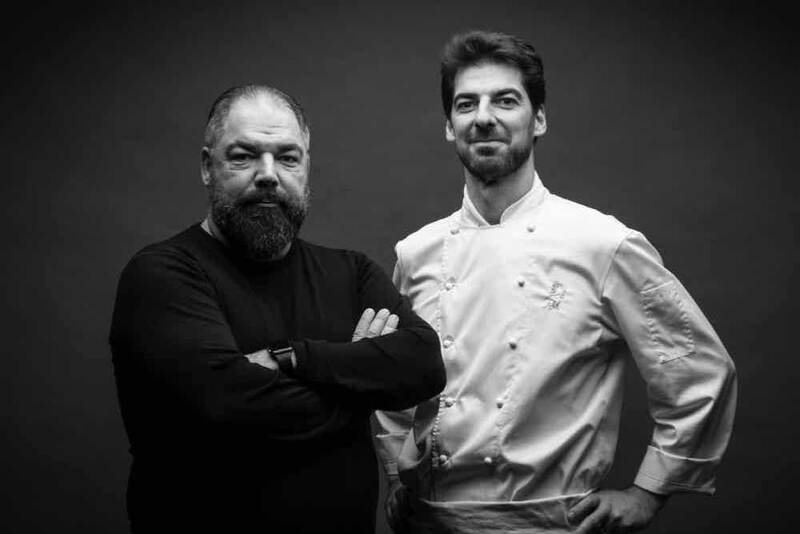 We first discovered Chef Alexandre Coullion, Gault & Millau Chef of the Year in 2017, on the gloriously riveting Netflix TV series Chef’s Table:France. I particularly loved the part where he teaches his daughter Emma to make her first apple pie. A father empowering his daughter in her aspirations for a future in the predominately man’s world of the commercial kitchen. He sets an example in his own kitchen of gender equality and zero tolerance for boys behaving badly. His remarkable story was so intriguing we simply had to find a way to get to experience his cuisine for ourselves. Alexandre grew up on the isolated island of Noirmoutier where his mum and fisherman dad ran a little “moules frites” mussels and chips place. He grew up with the sand and the sea his playground and his place to figure out the world. As a child, his surname (which means moron) provided an unfortunate opportunity for other children to tease him – so he had a pretty hard time. He wasn’t a good student, always day dreaming and full of restless energy. He was far happier out in the fresh air exploring the island. When he met his wife Celine in high school he decided he needed to do something to channel all his energy positively, for her. He decided to learn cooking. He didn’t simply learn cooking – he strived for perfection. Honing his skills to an exceptional level. He travelled to Japan confident that he could cook fish well only to discover a whole new world of Japanese precision. He learned the 350 year old Japanese technique of killing fish swiftly, Ike jime. The speed and precision of this technique brings about instant death, severing the spinal cord and blood vessels at the head and inserting a long need through the spinal cord interrupts all the nerve signals meaning the muscle of the fish gets no signal of death. Not only is this humane but it means the fish does not experience the tensing up response of a slower death. The meat remains very sweet and fresh. At only twenty two years of age he and Celine took over the family business. 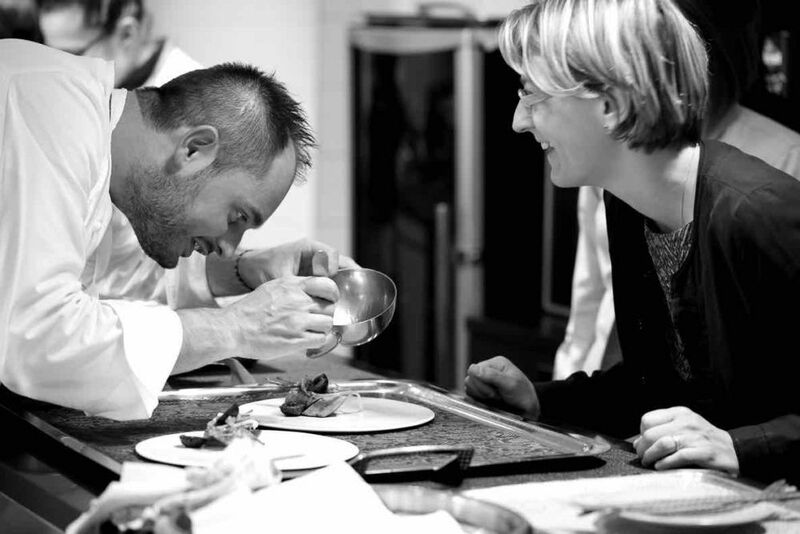 They lived in the flat above the restaurant and with Celine in front of house and Chef Alexandre in the kitchen they began to build their vision of a real restaurant (in the middle of nowhere). There were many days where they worked all day preparing wonderful fresh seafood and no one came. It was a really hard start. They talked about whether to stay and keep going, or to move on and start a new life away from their island home. Agreeing to a seven year commitment, they stuck at it day after day. It wasn’t until their sixth year when they had pretty much made the decision that they would have to go, that the news came…. a Michelin star! The tide had turned! With such a determined and honest foundation we are very excited to have the opportunity to experience Chef Alexandre Couillon and Celine’s passion and to give our little contribution toward their dream of staying in their island home. Travelling from Paris through the heart of France – the Loire Valley to Noirmoutier-en-l’Île, an island just off the south west coast of France is an exciting adventure in itself. 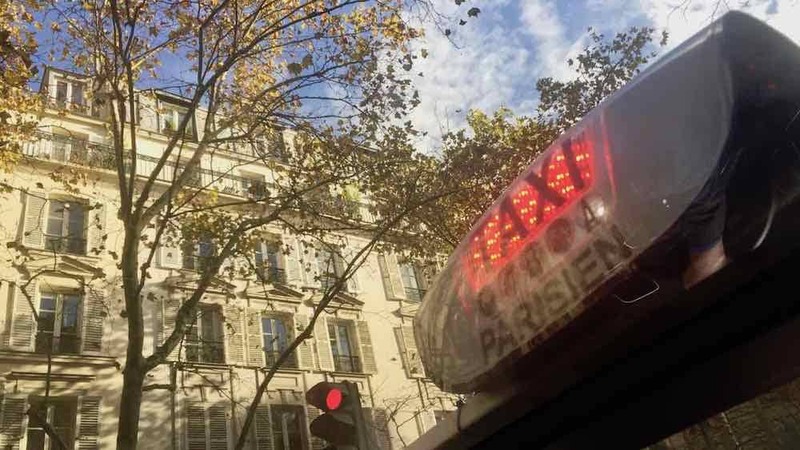 First a glass roof taxi ride through the grand splendour that is Paris. 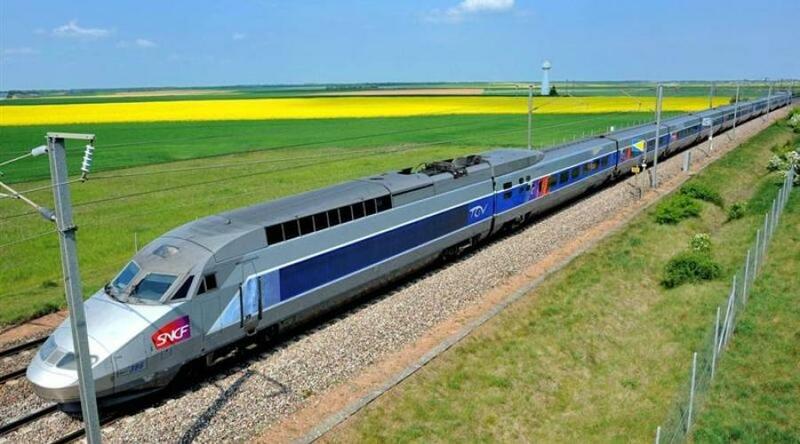 If that wasn’t enough to get the heart racing then it’s all aboard the TGV for a very fast, smooth and comfortable journey, a pretty trip along the Loire river to Nantes in upper Brittany. It is a magical train journey through softly contoured countryside and past slowly wandering waterways. Our last mode of transport for the day is a hire car, a massive shout out to the inventors of SatNav who managed to get us from well off track to our final destination – Restaurant La Marine. My first driving through France experience, takes the trip deeper and more intimately into the romance of the French countryside. The lush green fields are so very different to what I am used to seeing at home in Australia where the country is often dry and of varying hues of golds and browns. Here, all around me is the luminosity and moodiness of a Daubigny canvas. Golden edged clouds loosely brushed onto a warm grey sky, the small warm dot of the sun splashing lively reflections on the waterways. I strain my neck hoping to spot a famously gourmet Challans duck wallowing in the cool shallows. The fields laid out in pretty geometric patterns create a delightful tapestry dotted with pretty red and white cattle. Bare trees sway above pools of golden leaves laying on the ground beneath them, waiting to be swept away by soon to visit winter winds. We meander through pretty little villages where narrow roads, barely wide enough for two cars, wriggle between little old creamy cottages pushed up against each other like a mouthful of crooked teeth. I just love it, the character and history of yesteryear form such a pretty underpainting for a picture of today. The villages eventually disappear into the distance behind us and we are again enjoying wide green fields. We know we are close to the coast when salt flats begin to appear as well as the occasional little roadside stall selling bags of ‘Sel’. It is so exciting to see how the magical fairy dust of France is made and even more exciting to know we are getting very close to the island. The road stops abruptly where we find the Atlantic Ocean lapping against the edge of France, the road disappearing under blue grey waters that swirl between us and the island visible across the way. Visitors wait at the beck and call of Mother Nature. Then like a parting of the Red Sea, the tide retreats, miraculously revealing the hidden passage to the promised land of Noirmoutier. It is magical, moving and humbling and evokes a deep sense of gratitude for the privilege of visiting this tiny island community. There is a bridge these days, further around the island but there is something fascinating about the traditional eighteenth century access road. 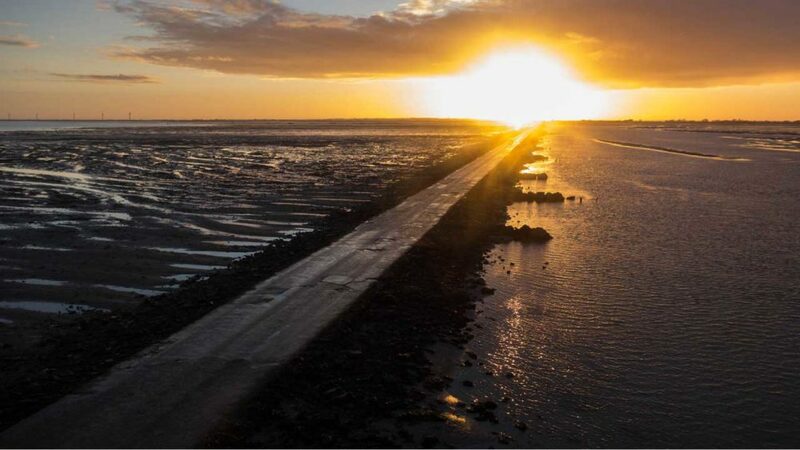 The ingenuity of the people who decided to build a road on the ocean floor! 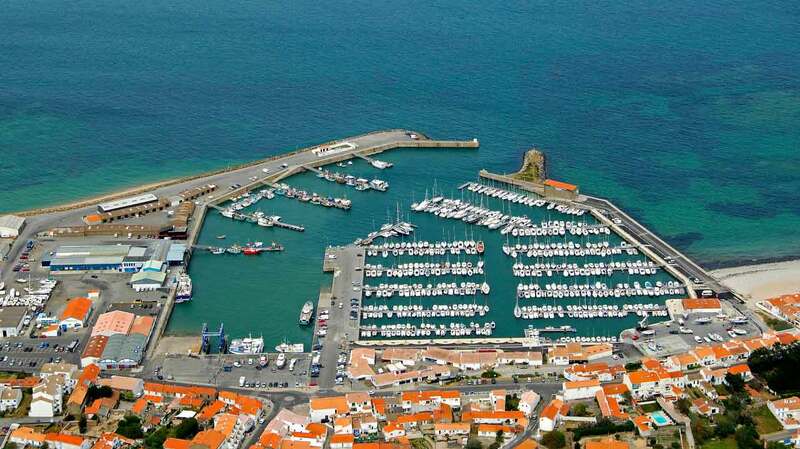 Safely on the island we make our way to the fishing port at de l’Herbaudiere to find Restaurant Le Marine. After exploring the island a little, we finally arrive on Rue Marie Lemonnier. In a row of quintessentially French village cottages we spot it, Le Marine! Oh my goodness this is it, how pretty! Alexandre and Celine have also acquired the cottage a couple of doors down from the restaurant and recently renovated it to create a small five room boutique hotel, La Maison Moizeau. Opening not long before when we are visiting, it is as though the universe has arranged another happenstance of perfection just for us! We are staying the night so we are free to relax and experience Alexandre and Celine’s hospitality. We swiftly abandon the hire car and go to investigate the restaurant, trying to peer in windows looking for where we should go. We find the side entrance to the restaurant and Celine’s sweet, uplifting smile greets us. A few instructions as to where we can park our car and we are taken to our beautiful little hotel room. Celine and Alexandre have created a stunningly modern, yet sympathetic to the era of the building, space. They have not fallen into the easy “twee”, antiques roadshow, live in the past, approach! The exterior of the hotel is French village, inside we are transported! 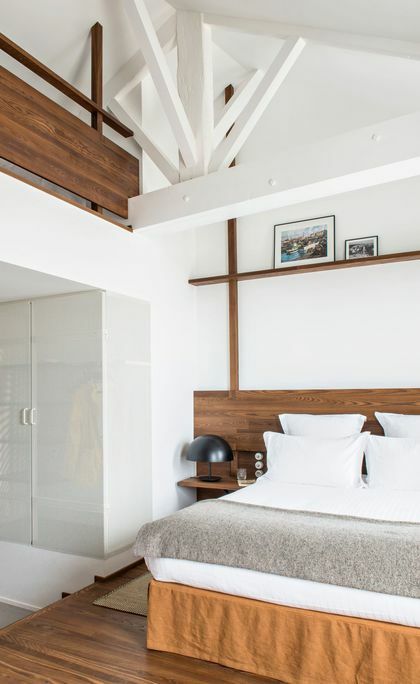 Modern lofty spaces, blond timbers, simple strong lines, minimal earthy decor, such a lovely surprise. Celine takes us to our room overlooking the Marina, it is just gorgeous. Generous in proportion, very comfortable with all the little things considered. From an initial sweet treat from the chef to luxurious bathroom inclusions. There is even a gorgeous little notebook which of course I love! Celine brings us a coffee to refresh us after our drive and bids us farewell till we meet again for dinner. We relax for a couple of hours sipping espresso, enjoying the view of the marina across the way where the fishing boats that brought our dinner in earlier this morning, now bob about at rest for the evening. Finally its time and we dress up and head out to the restaurant. 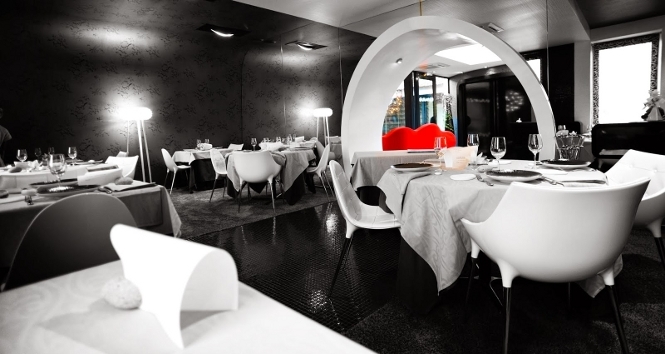 Restaurant La Marine’s decor is unique, uber modern, black walls and floors and high gloss white circular arches. Again it is such a refreshing and vibrant unexpected approach, the old French village exterior giving absolutely no hint to the extraordinary interior. We are seated at what feels like the royal table, at the end of a black glossy mosaic tile path, centred to the room, the other guests scattered to our left and right, how very special! Subtle accents of warm orangey red are dotted sparingly around the room. A curvy red sofa in entry, a striking red drip down the centre of the window blind behind our table, a soft golden edged flower in a bowl and a texturally enticing pair of potimarron perched on a glossy back shelf. Quickly our first amuse bouche arrives. Welcome potatoes, the famous local potato. The only place in the world that it grows is on the island of Noirmoutier. La Bonnotte potato is a fragile plant with a very short growing season of only ten days at the beginning of May. So delicate it can only be gently hand harvested. This is not only the most expensive potato in the world, but at up to 500 euro per kilo is also considered one of the most expensive foods in the world! Tonight Alexandre has showcased it most exquisitely in a trio of celebration. 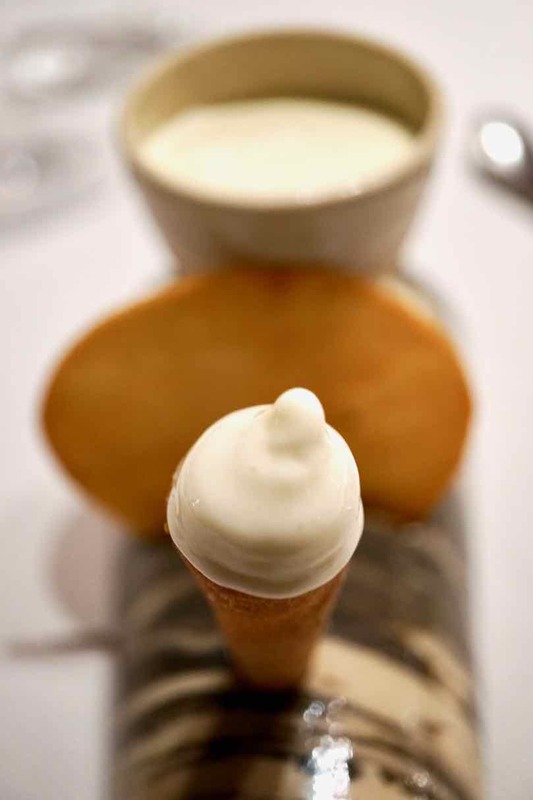 Firstly icecream, a surprisingly invigorating frozen treat served in a tiny icecream cone. A chip, a single potato crisp, golden and nutty. Finally a small shot of warm, creamy, absolutely delicious purée. This potato has a depth of flavour that is quite surprising, earthy, lemony and salty it is like my lemon thyme potato’s but all inside it’s own skin! Our next amuse bouche is seaweed chips and egg of fish with cream. Oh my what a wonderful thing, little curls of crispness hold delicate spheres of cream topped with glossy, Chardonnay coloured beads, fish eggs! Just get me a big plate of these and a glass of chilled wine and I would be very happy! Now smoked mullet. The plating of this dish is visually inspired. A black earthenware plate is decorated with dry, crispy, golden, boney fish skeletons. 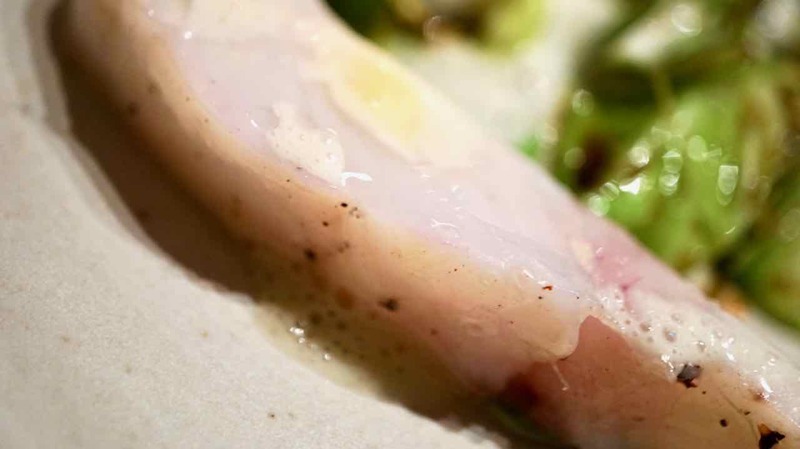 Juxtaposed are small morsels of super moist and glossy smoked fish flesh. It is just beautiful, and the fish, smoky, delicately oily and with rich yet mellow flavour. Next tartlets of pumpkin from the garden. Pretty little orange bites, crispy pastry, bright orange pumpkin flesh and the finishing touch of flower petals that I think might be marigolds. Crispy, naturally sweet, these are simply exquisite little bites. A little white lidded bowl contains our next surprise. 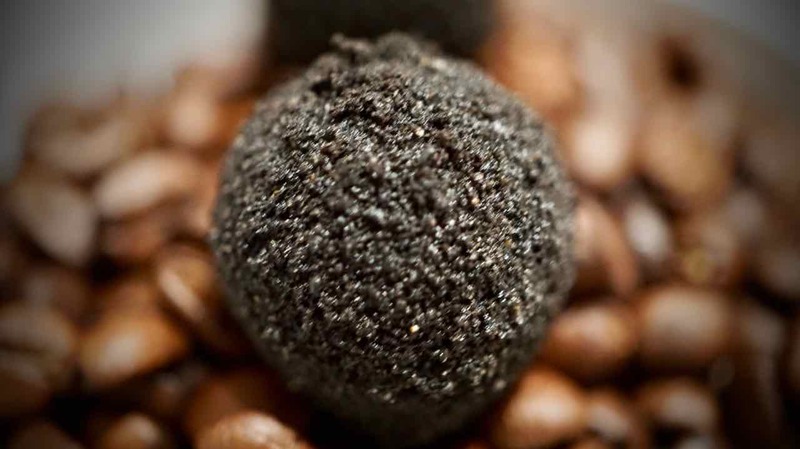 The lid is lifted, revealing a dark chocolate looking ball resting on a bed of coffee beans. But all is not what it seems, this little treasure is actually a fish cromesquis and it is delicious. The dark outer shell cracks open to reveal a wonderfully moist and flavoursome fish filling. Yum! The amuse bouche selection finishes as it started with a trio of treasures. Three little bowls on a narrow serving board. 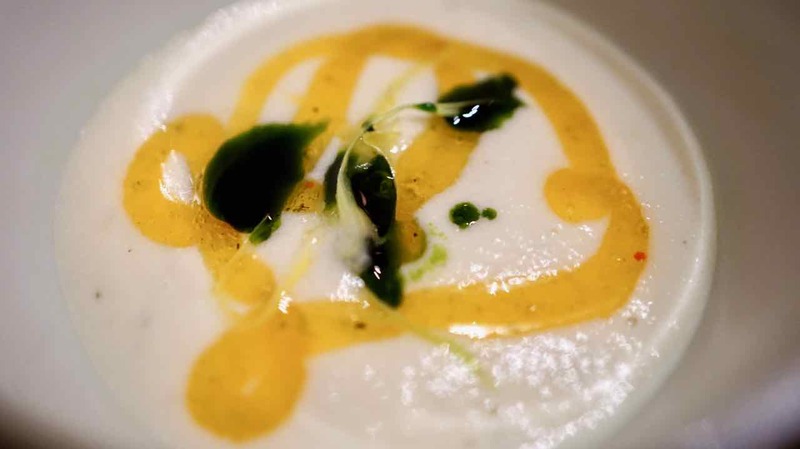 First is a creamy, light preparation of celeriac and onion with egg yolk. The result is like a little savoury baked custard. It is comforting and moreish, so very good! 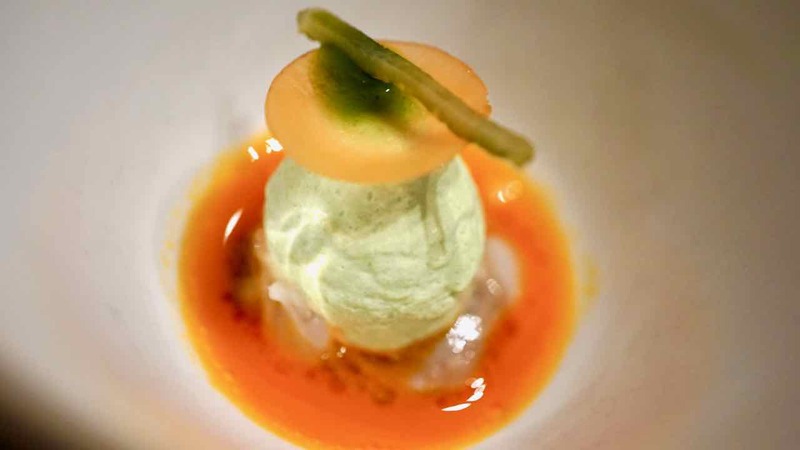 The next bowl holds little clams bathed in a vibrant orange carrot juice and topped with a scoop of pale green tarragon mousse. The flavour combination is genius, the natural sweetness of the carrot with the little salty sweet clams beautifully accented with the subtle aniseed fragrance of the tarragon! 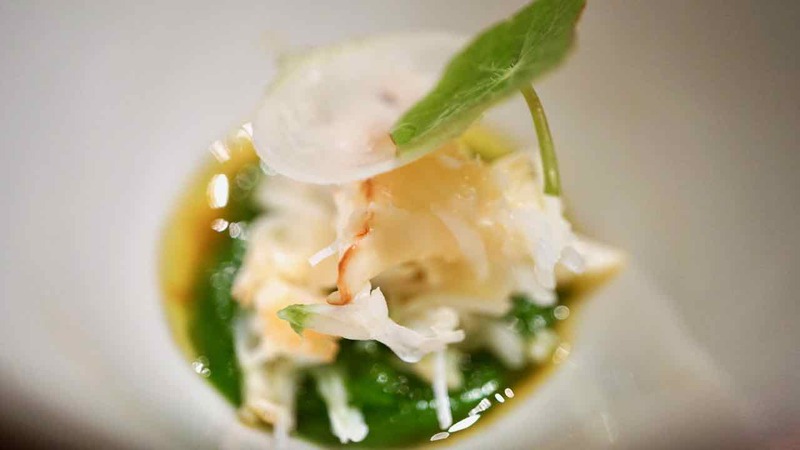 Lastly crab, sweet delicate perfectly cooked crab sitting in a bright green spinach puree. The spinach puree is light and cold and such a subtle flavour, a perfect backdrop to allow the delicate sweetness of the crab shine. What an amazing tour of the produce and the seafood of the region with two different types of fish, clams, crab, fish roe and that is only the amuse bouches. 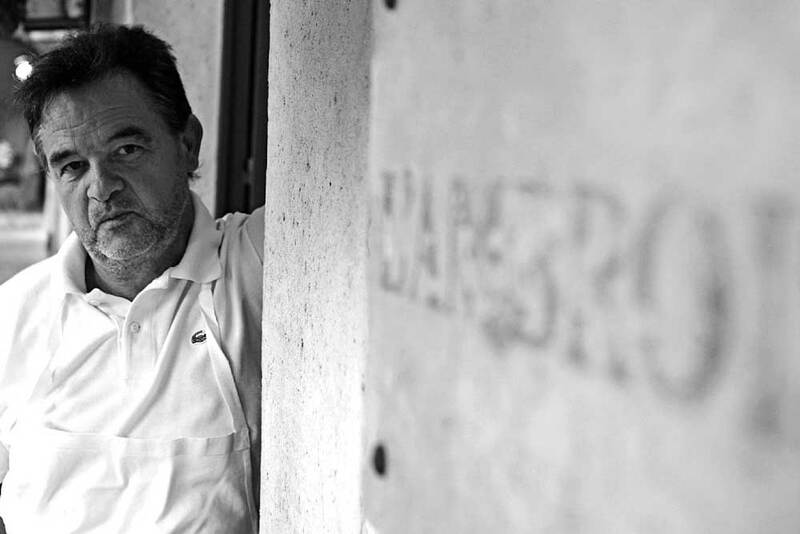 Chef Couillon’s has certainly whetted out appetites and turned up the volume on our anticipation for what is to come next. The first course arrives and my oh my, it is a glorious thing! 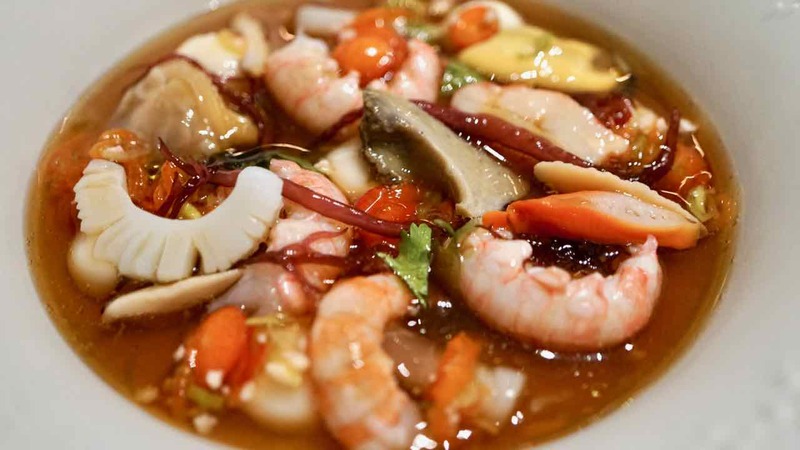 Sea Side – a deeply generous and richly diverse selection of the fruits of the sea; abalone, razor clams, local crab, langoustine, mussels all bathed in the most wonderful, intricate and exquisitely flavoured seafood broth. Each piece of seafood is absolutely perfect. 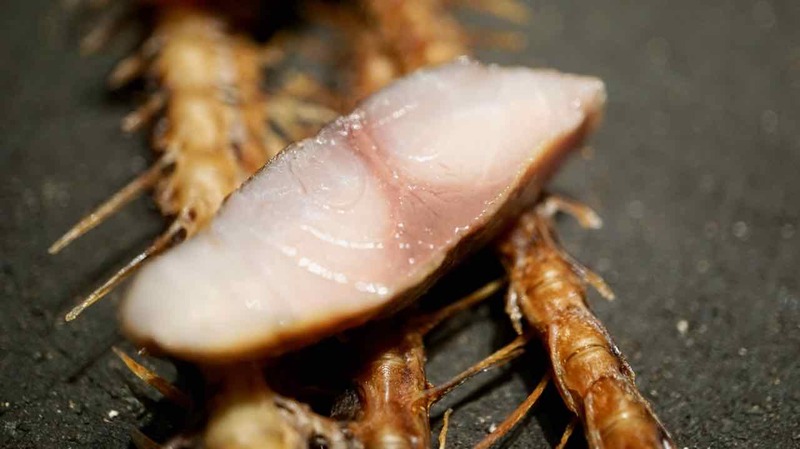 Incredibly tender abalone, translucent just set langoustine and shell fish just warmed. This is heaven in a bowl, from a man who has very clearly mastered his craft. 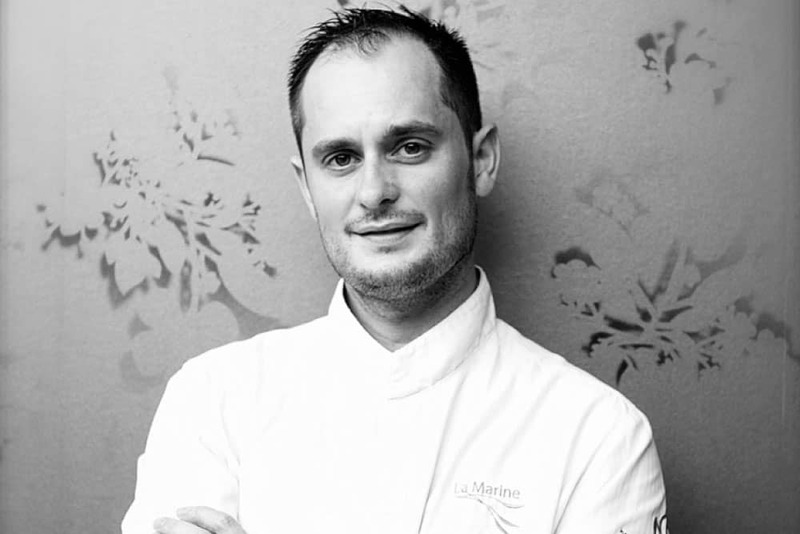 In my mind Chef Alexandre Couillon has just been crowned King Neptune, king of the sea! On the 12th of December 1999 just as Alexandre and Celine were beginning to develop their version of La Marine, disaster struck the island. During a fierce storm off the coast, an oil tanker called Erika was torn in two, it’s toxic cargo spewing into the sea, devastating the fragile ecosystem of the French west coast. Some of the worst affected areas were the off shore islands. On his Chef’s table episode Alexandre tells of taking his daughters to play at the beach years later and their little hands still becoming blackened. I can imagine how devastating this disaster must have been to the locals, particularly those like the Couillon’s, so passionate about their local produce. Fast forward to a day in the kitchen where an accident in the kitchen resulted in what initially seemed like an over reduced squid stock. 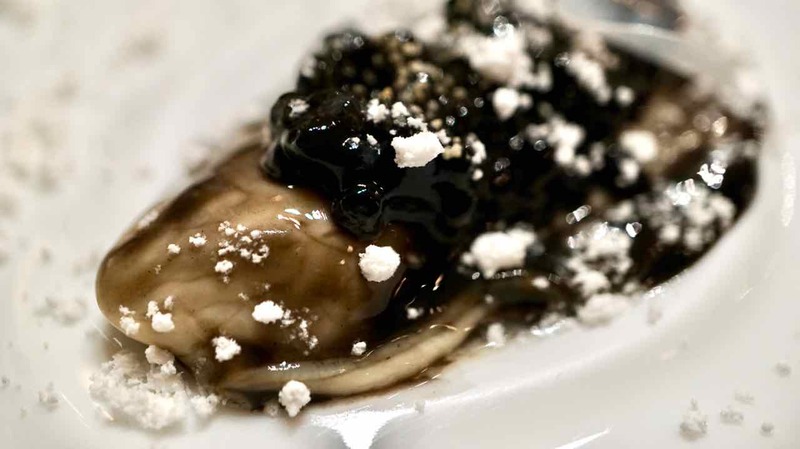 Initial disappointment at the thick, pitch black congealed liquid in the bottom of a pan suddenly turned to inspiration when Alexandre tasted it. Revelation! It was amazing! 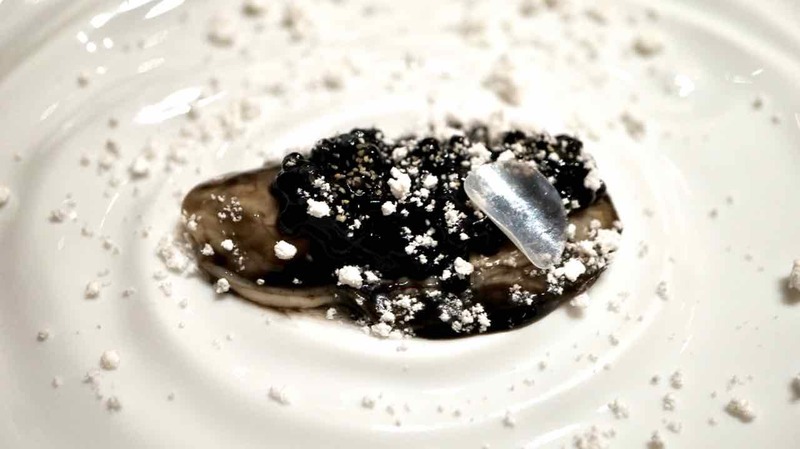 Reminded of the Erika oil spill he grabbed an oyster and dragged it through the glossy blackness, the result was the birth of a signature dish. The plate when it arrives is very beautiful, striking glossy blackness contrasting with the vivid white canvas of the plate. Initially I am trying to make sense of what visually does not immediately say food. We are advised to cut the oyster, its a very good size! Cutting through, I scoop up oyster and sauce and pop it onto my mouth. A wave of pleasure and wonder washes over earlier uncertainty. This is not just a visually challenging, quirky, thought provoking dish, it is an exquisite perfectly balanced expression of flavour and texture. 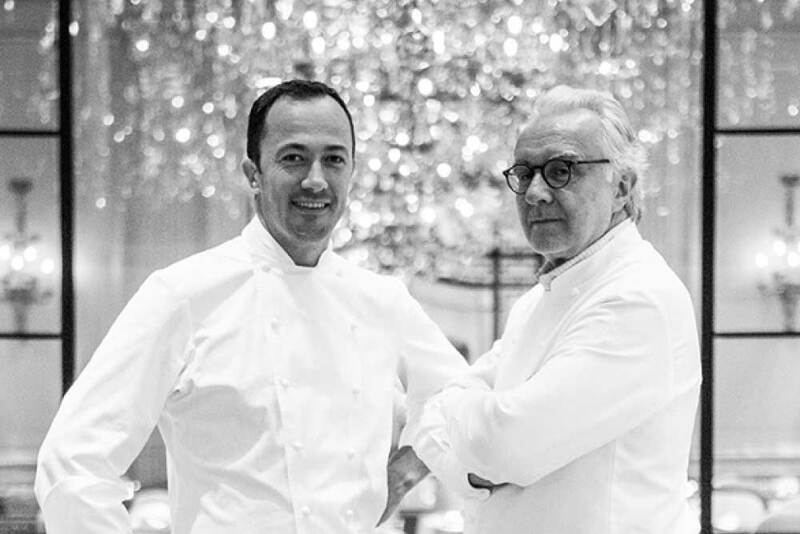 Spiritually it is a moment to celebrate being here in the house of Chef Alexandre Couillon. Our waitress Marine, yes the same as the restaurant (we wont forget that in a hurry) brings our next dish. St Jacques, Scallops with beetroot and parsley sauce. 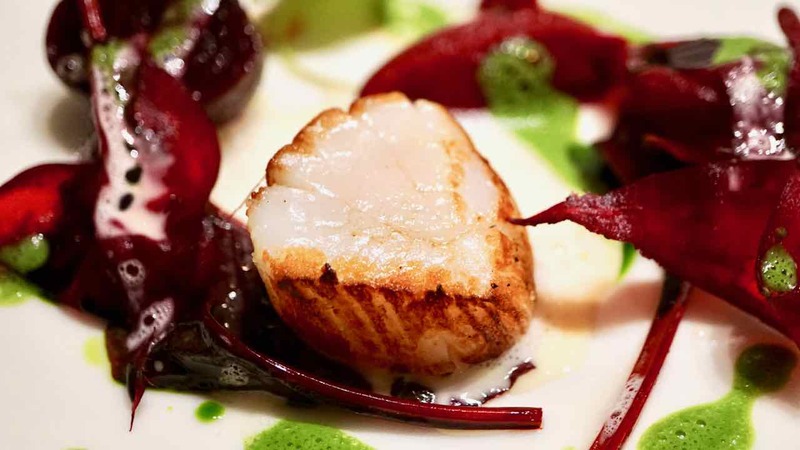 It is a fresh, lively, colourful plate, bright green and beet purple, beets and leaves and a perfect scallop. Beets from the garden have been prepared three ways, puréed, shaved and pickled. The deep beet purple complimented by pretty beet leaves and and a vibrant green parsley sauce. 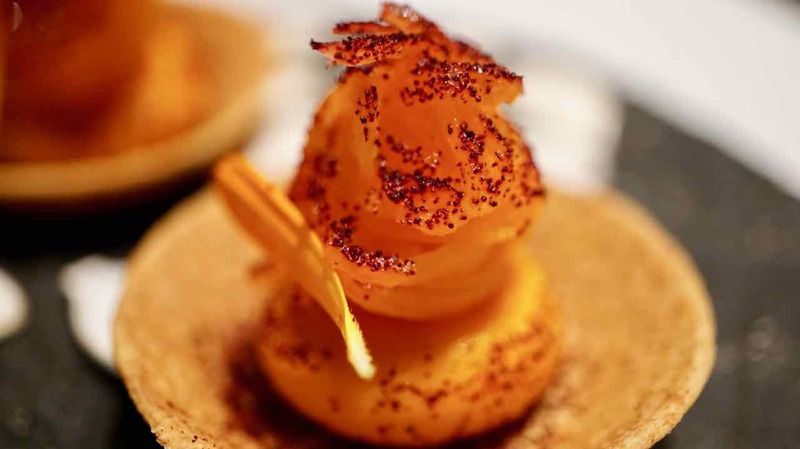 The golden edged scallop is perfectly cooked and perfectly seasoned with sprinklings of crunchy salt that sparkle on my tongue right before the sweet meat melts in my mouth. As I eat and the pretty leaves and beets disappear leaving only the juices I am mesmerised. Bright green and purple play together on the plate like marbling ink, making me want to play with it and make a painting. The sense of colour, playful composition on the plate and most importantly the combination of textures and flavours makes for an exciting and inspiring pleasure festival. Lieu Jaune, a delicate white fish is our next delicious expression of the local seafood. Served with carrots from the garden, spinach and a sea urchin sauce. The little carrots, both whole and puréed are so beautifully sweet. The fish is really pretty on the plate, I’m fascinated with the pink and green pearlescent reflections in its flesh. It’s amazingly mild and delicate in flavour with crispy skin and large firm flakes it is a really lovely fish to eat. The sea urchin sauce is out of this world. The light foamy texture belying the depth of flavour. The combination of flavours on this plate make me want to lick every bit off the plate. Stunning! Our next ocean treasure is turbot with cabbage and almond and onion sauce. On a wide, earthy grey plate the white fish and bright vibrantly fresh greens create a striking composition. This artwork looks simple but feels filled with so many little nuances that make it so very special. The flavours in the almond and onion sauce are incredible. Sweet, caramelised, milky and creamy. But again there is a lightness. With a forkful in my mouth, I close my eyes and it feels like a deeply, richly rooted idea that slowly rises, ultimately floating to the heavens and lifting me with it. The cabbage is dark elongated leaves that make me wonder if it is Kale Nero? What I do know is that the super fresh brassicaesque flavour is delicious and I am a massive fan. The turbot is incredibly fresh, a light, clean sweet fish that is beautifully complimented by the vegetables and sauce on the plate. 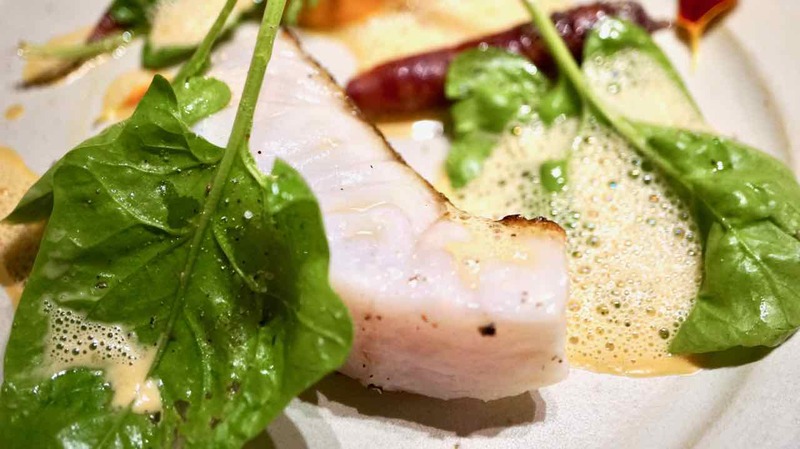 I am really enjoying Alexandre’s very pure and Refined style – the lightness and freshness of his food is invigorating, each plate filled with life and energy. The next lively and colourful plate set before us is our meat course. A soft grey textured plate is puddled with a rich juniper jus that surrounds a beautiful loin of Roe Deer. 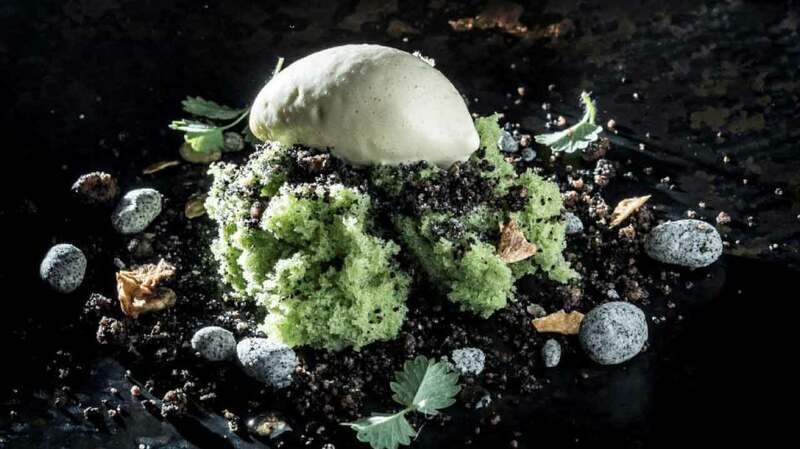 A small mound of quince puree sits next to the deer and glossy deep green and purple leaves of Swiss chard are draped softly across the plate. The deer is stunning. Beautifully tender and juicy and such a mild flavour, much less robust than venison. Chef Alexandre Couillon has created a delightfully salty and crisp edge to the meat, only a couple of millimetres of the meat has this wonderful crust, the rest of the loin has a perfect and even pinkness throughout. Dragging a forkful through the incredible jus and anointing with a little of the sweet slightly sharp quince creates a perfect bite, so delicious! The chard is such a clever accompaniment. The stem, tender and sweet ; the leaves, just wilted are refreshing and leaning ever so slightly toward bitterness. 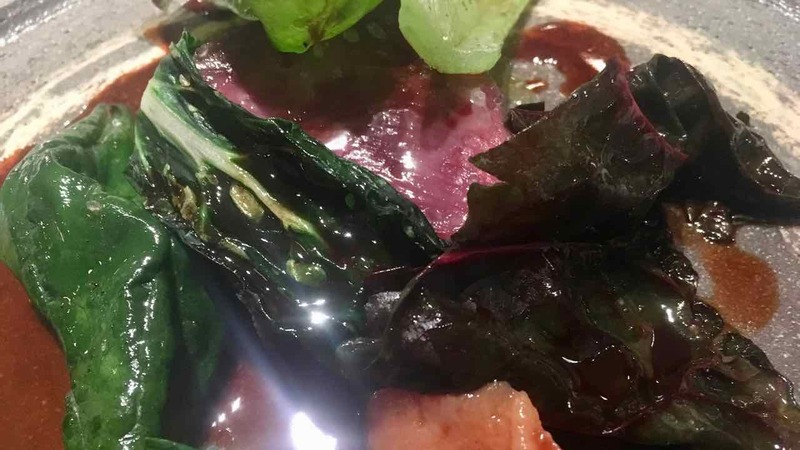 Swished in juniper jus and with a bite of meat and piquant quince, it brings a fresh, vegetal element that balances the dish perfectly. It is time to turn from savoury to sweet and Alexandre’s segue could not be more perfect. Celine and Marine bring ice cream smoked on a fire. Yes ice cream, smoked…..on a fire! None of these things seem to make any sense. So I know that where there is smoke there is usually fire, but ice cream? Really? Celine explains that the cream has been smoked over a fire ….before….being turned into the ice cream. The plating of this dish is so very pretty. A little earthenware bowl, brown muddy clay on the outside with a glossy creamy grey glazed inside. 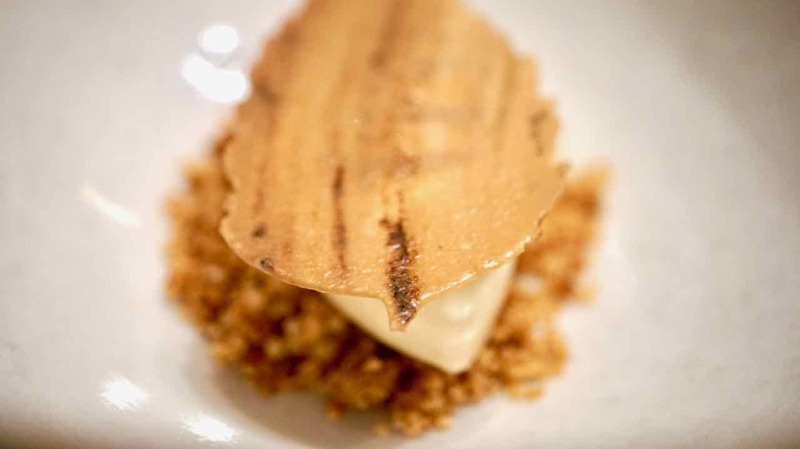 A golden crumb scattered in the bottom, balancing a perfect quenelle of the ice cream. The final touch a paper thin, crisp, golden autumn leaf flecked with dark smoky specks of deep brown. Closing my eyes I smell smoke, not hickory smoked food smoke but real, log burning on a fire, smoke. As the scent of a cosy winter swirls around me my spoon crunches through the crispy leaf into the creamy snow below. All my senses are fired up with this dish, so simple and pure, creating a magical fantasy winter wonderland. 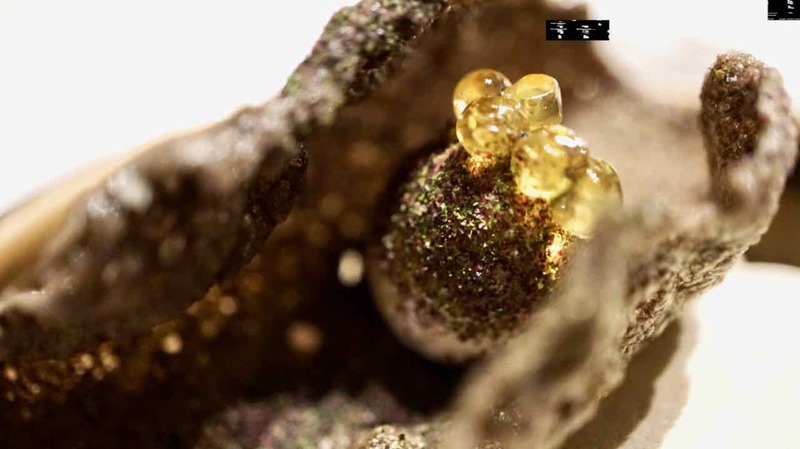 Stones, earth, moss, the next plate is a gentle walk through a deep cool forrest. Celine’s lovely face lights up as she explains that we have green tea sponge “to remember the moss”, chocolate crumb “to remember the earth” along with pine sap icecream and little grey edible pebbles. This is a thoughtful, elegant dish, one that takes me to a peaceful place of contemplation. Closing my eyes, to focus on the amazing combination of flavours and textures, every bite is delicious. Moist light sponge bright green, with that fascinatingly vegetal and fresh flavour that I love about matcha green tea. Rich chocolate crumbs dance on my tongue peppering the gorgeous creamy ice cream. Heavenly! Our next dessert plate is entirely different. Warm sunny colours on a deep white plate feel happy and vibrant. Pumpkin ice cream, beautiful orange, earthy and sweet. Chestnut biscuit, more cake than biscuit to me, with a fabulously earthy chestnutty flavour. Thin slices of dried pumpkin are a perfectly, naturally, sweet textural element. Sticky dots of toffee and coffee are the glue that tie the entire dish together. I cant quiet find the words to adequately describe the joy of this dish. 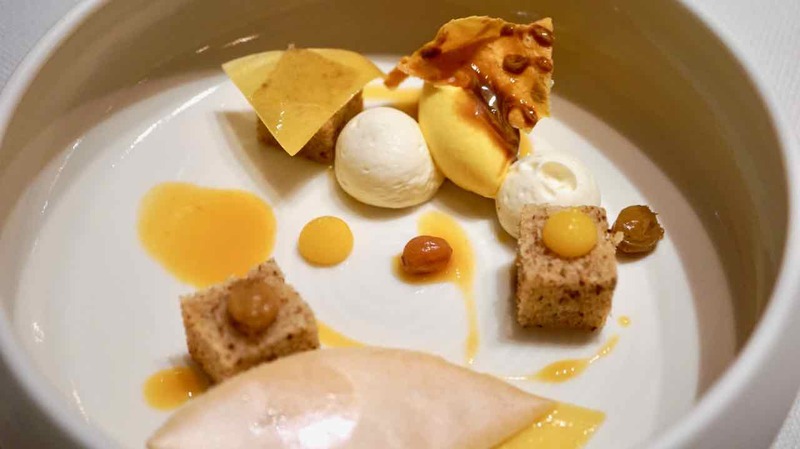 For me, not a big sweet tooth, I think it is the balance that Alexandre has achieved with celebrating the natural sweetness of things, without artificially enhancing them with sugars that so impresses me. Happiness on a plate! A wonderful collection of sweet treats come swiftly one after the other until we have a magical little picnic set before us. On a little white plate, a shot glass of creme de menthe sorbet, gorgeously refreshing and a mini pudding bowl holds a chocolate cherry mousse. Think black forrest cake cake mousse in a bowl. Rich flavours, light texture, just beautiful. A round timber board holds two lovely glossy chocolate tartlets topped with grains de courge or as we know them, pepitas, pumpkin seeds. 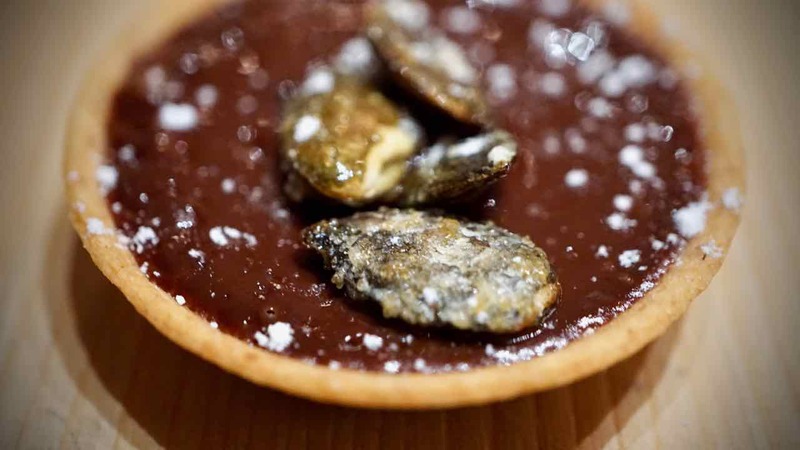 The rich chocolate is deeply satisfying and the yummy nutty crunchy toasted pumpkin seeds are sensational. Marine removes the lid of a creamy clay pot revealing a spiral of creamy white something. Marine tells us it is French meringue, guimauve, a la reglisse, licorice flavour. I have to say it is a most fascinating thing. Pulling stretchy little pieces off the spiral I pop a piece in my mouth and it is weirdly fantastic. Light, fluffy, elastic, with delicate fragrant aniseed flavours. Simply a bunch of fun! A deep bowl with a chocolate crumb filling the base like soil, holds a selection of fascinating treats. Little dark purple beetroot jubes, pate de friut betterave rouge. Gorgeous little cubes of jelly sweets dusted with sugar. I love the idea of vegetable lollies! Meringue aux feuilles de figuier, meringue with fig leaves. 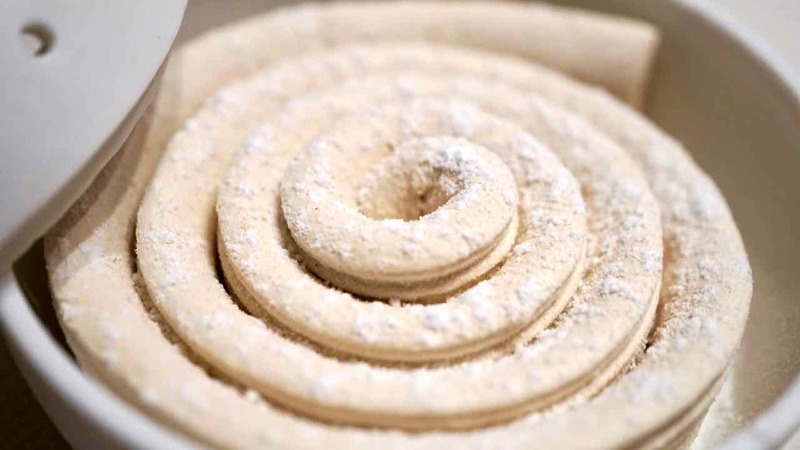 The two slender white cylinders of meringue are exquisite. 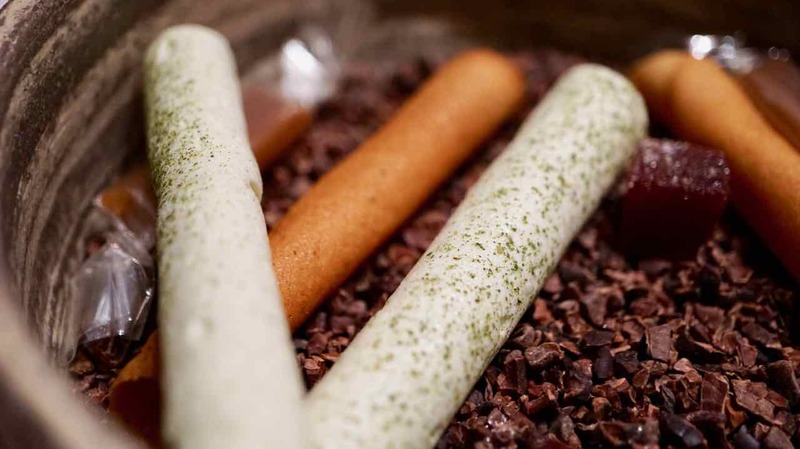 Crispy delicious tuilles are rolled into cylinders, forming dessert ‘cigarettes’. My very favourite is caramel of the house, with fleur de Sel de Noirmoutier. The wonderful salt from the salt flats we saw on the way here. Wrapped in cellophane, these caramels are decadent and moreish. Taking me back to my favourite childhood lolly but with a wonderful modern and lively twist. It has been a wonderful evening. The menu has celebrated seafood and vegetable. The best from the land and from the sea. It is hard to describe the food as anything but simply perfection. 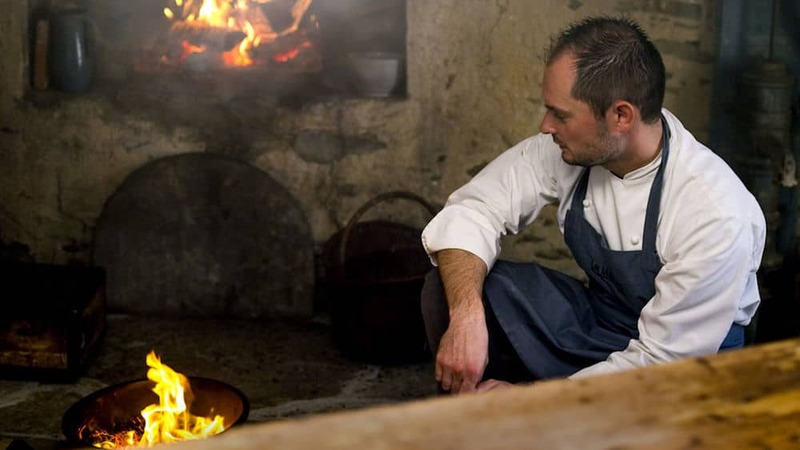 There is a life force in Alexandre’s cooking that feels like he has weaved some kind of spell that brings the deep source energy of the earth and the sea and imbues each dish with it. The eating of it has filled me with calm and serenity. Celine and Marine have provided faultless service that has absolutely honoured the efforts in the kitchen. Feeling light and happy, we wander slowly back to our little room, ready to sleep and dream about our wonderful evening. The next morning we enjoy a wonderful breakfast. Celine again on duty, serving a fabulous selection of meats, fish, cheese, breads, fruits and large steaming bowls of good strong coffee from the little kitchen downstairs. Finally its time to return to Paris. And what could be a more perfect finishing touch than to see the sun slowly rise over the ocean as the tide ebbs revealing the hidden passageway back to the mainland. 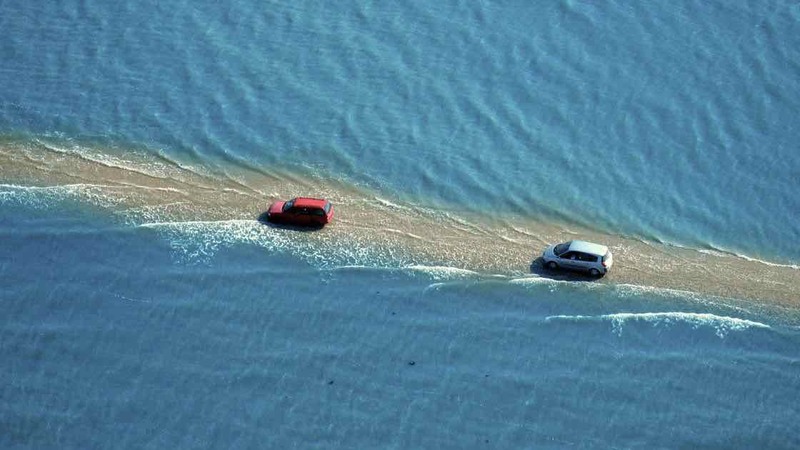 Le Passage de Gois is a natural, periodically flooded passage leading to the island of Noirmoutier in France. 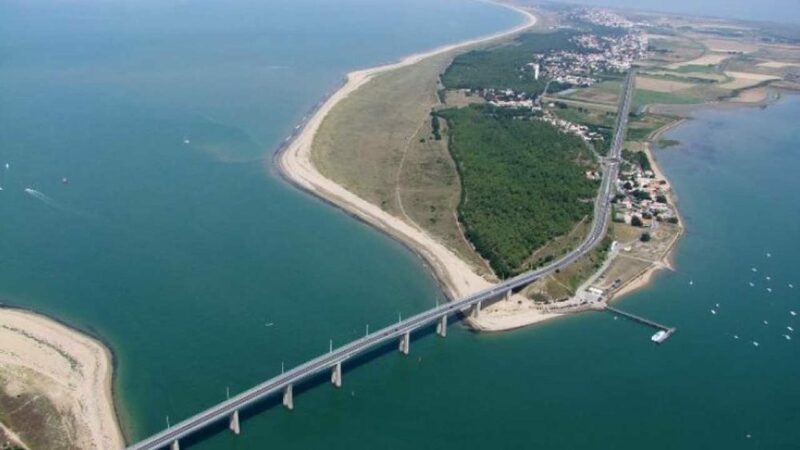 It is located between Île de Noirmoutier and Beauvoir-sur-Mer, in the department of Vendée. It is flooded twice a day by the high tide. Length of this track is 4.125 km.